Native & Search provides reporting capabilities that allow you to track key metrics required to manage and optimize your campaigns. ad spend as well as other metrics specific to your campaign’s marketing objective. You can break this information down by various campaign levels (campaign, creative, keyword), by targeting dimensions (such as geo, device), by specific features (ad extensions, product ads), and other other attributes associated with your campaigns, creatives. You can view a high-level overview of your campaign, ad, keyword performance from the Reporting Dashboard or you can get more granular performance breakdowns on the page. You can export and schedule reports. You can consume data via reporting APIs. You can query up to 13 months of data, although in some cases this is limited to a shorter date range. Metrics are available across search and native campaigns. Reports will only show data for entities that served during the requested time interval. Metrics are always in your account’s currency and timezone. Once you log in to the UI, you’ll have a quick view of all of your ad groups, ads and keywords across your campaigns, and this will make it easier to manage your portfolios. Instead of drilling down campaign by campaign, you have broader visibility and a better understanding of how your ads and keywords are performing. We’ve added tabs at the top of the page to enable toggling between a snapshot of campaigns, ad groups, ads or keywords, including their individual performance. Do you need to search for a specific ad or keyword in the account? Or update bids and make edits to ad titles? Simply, filter based on your requirements and you’ll be able to take appropriate actions. Native & Search provides you with an enhanced Key Performance Indicator bar (KPI bar) in the UI that lets you view and customize charting data and key performance metrics for your campaigns, ads, ad groups and keywords. As an advertiser, you’ll be able to see hourly data for your campaigns, ads and ad groups, so that you can do day-parting bid optimization for enhanced campaign performance. The following are some of the tasks you can accomplish when working with the KPI bar in the Native & Search UI. Click the more icon in the upper right corner of the KPI bar and select Customize KPI list from the dropdown. A list of all available metrics will appear. Click the add/remove icon next to the metric to customize what metrics are shown on the KPI bar. To customize the KPI bar, you’ll need to remove the metrics shown on the chart. A minimum of 2 metrics are always displayed on the KPI bar. Click the more icon in upper right corner of the KPI bar, choose Select a price type from the dropdown. A list of all available options will appear. Once you apply a filter on the price type, the metrics and chart will update for the filter. The description of the selected price type will appear on top of the chart. You can choose only the price type for which you want to see the metrics and charts. Click the more icon in the upper right corner of the KPI bar, then click Hide chart. To bring the chart back into view, click the more icon in the upper right corner of the KPI bar, then click Show chart. You can now select the metrics you want for the charts from the KPI bar. To select a different primary metric, first undo the selection by clicking on the selected primary metric, then click the metric you want to select as the primary. To select a different secondary metric, simply click the metric that you want from the KPI bar on the top. You can see up to 2 metrics at once in the same chart. If you need a more in-depth view of account performance, you can take advantage of Native & Search’s intuitive interface for all your reporting. Use the Reporting tab to create your customized reports, run them on demand or schedule them to be delivered via email. 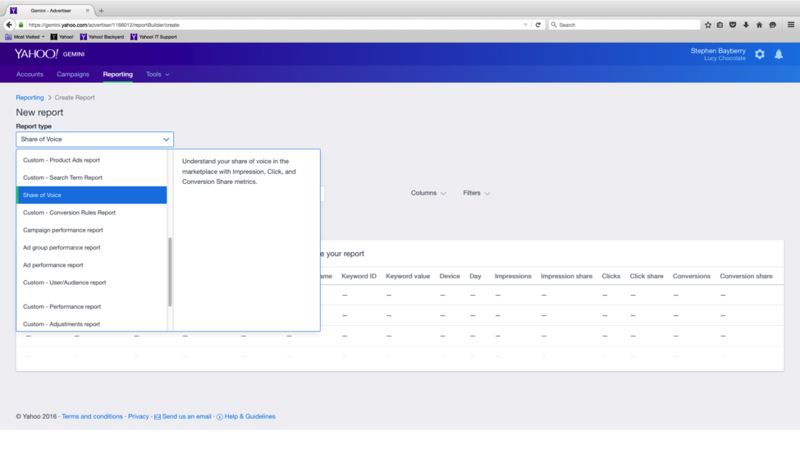 We’ve refreshed the report center to make pulling reports, and getting the data you need, more intuitively and with less effort. The necessary fields for key reports are now preselected, while others are grouped to make customizing your reports a snap. If you can’t find what you’re looking for, a search box is available to quickly find the fields you need. Plus, you’ll get a preview of your report format to ensure you are requesting exactly the right data for your needs. We’ve updated our reporting capabilities to make granular reporting data easier to access. Now you can get check out your performance by the hour. Simply select the hour option from the detailed view when you create a new report. This makes it easier to understand your customers’ searching habits, and tailor your targeting accordingly. Are your customers more likely to make purchases at certain times of days? Now you can pinpoint those fruitful times of day, and use ad scheduling to boost your bids to ensure you reach these searchers. Now available in the report center, the Share of Voice (SOV) report uncovers an advertiser’s share of impressions, clicks, and conversions (if Dot is enabled) for a given keyword compared to other brands bidding on that same keyword. This allows search advertisers to understand how competitive they are in the Yahoo Native & Search marketplace. For the impression share metric, for example, we look at the number of impressions that an advertiser’s campaign received for a keyword. We then compare it to all of the impressions available for that keyword across the marketplace to determine if an advertiser has a dominant share (i.e., 100%). This feature provides transparency into our competitive marketplace, enabling advertisers to see how they stack up against the competition and how they might improve their position. 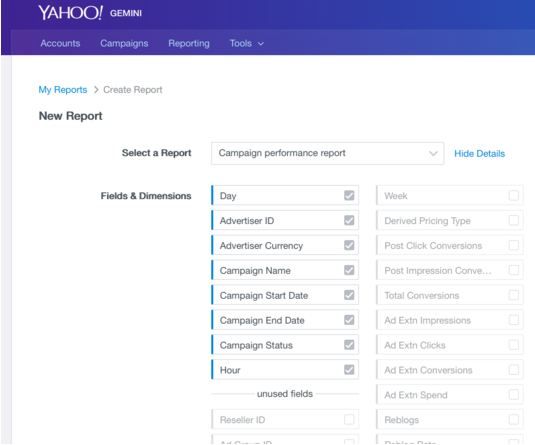 In Native & Search report center, as part of campaign and ad group performance reports, you can now take advantage of Impression Share for Native. Using this capability, you can uncover your share of impressions for any given account, campaign and ad group compared to other advertisers who are bidding in similar audience targets. This allows you as a native advertiser to determine how competitive you are in the Yahoo Native & Search native marketplace. For example, an impression of .5 percent means that you have lost that percentage to another advertiser. Using Impression Share for Native in Native & Search, you can either increase your budget to make up the difference or find new targeting attributes. By definition, Impression Share is the total number of impressions served versus the total number of impressions that are available. Total impressions served are those served from either your account, campaign or ad group based on your audience targeting attributes. Any attributes that are not supported will result in an N/A result. The total number of available impressions are those served from either your account and others that contain the same audience targeting attributes. For example, if a competitor’s campaign contains the same attributes along with other custom segments, the impression is still counted. If you request an Impression Share (Native), and find that certain columns are not compatible, you should remove those columns and try again. For a list of incompatible columns for campaign and ad group performance report types, refer to Incompatible Columns. Share of Voice metrics can also serve as an indication of ad quality and help inform an optimization strategy. At the ad group or campaign levels, if the impression share is high but the click or conversion share is low, then it may be time to optimize ad creative. If your ads are being viewed at a high frequency but are rarely leading to a click or an action by the consumer, perhaps a snappier headline or clearer call to action would help? Conversely, if the click and conversion share metrics are much higher than the impression share, increasing your bids may help get them in front of more searchers.